I made a promise on Instagram this morning that I’d get a backyard progress post up. And I know I’ve been saying the same thing on here for days now. So, I hereby dedicate my entire afternoon (yes it will probably take me that long) including all available precious few moments of near silence with Miss E asleep and Master W temporarily convinced to sit still in one place, to show you where we are at with our deck and backyard. Spot the difference?! I promise it does get more exciting. But first I’m going to thrill you with the process. If we had to endure it, it’s only fair I get to share it right? 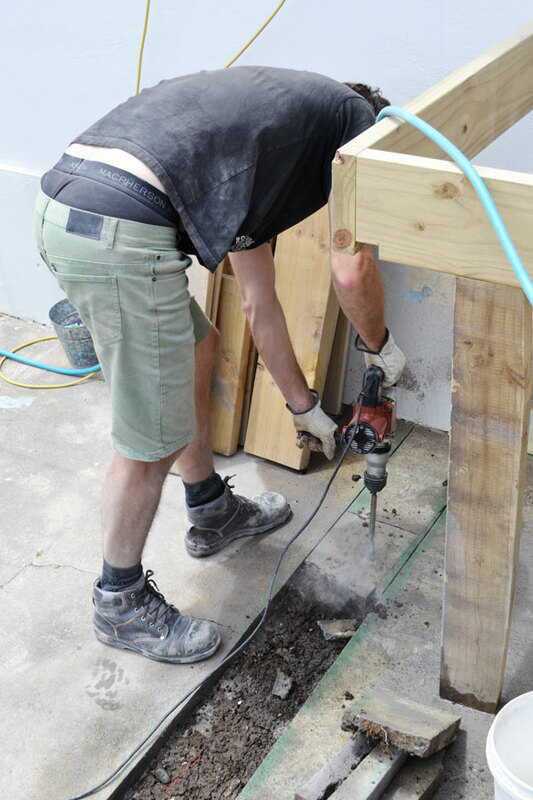 This stage started yet again with cutting and drilling and digging and chipping out a couple more holes (but with much less grumbling because they could be the last) for the pergola posts. 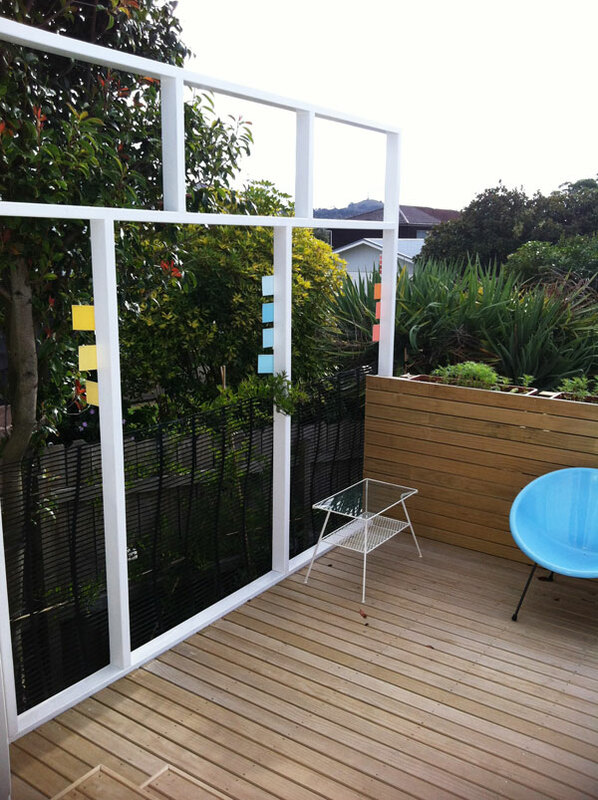 And I started with the fun task of choosing colours for the mid century screen on the side of the deck. 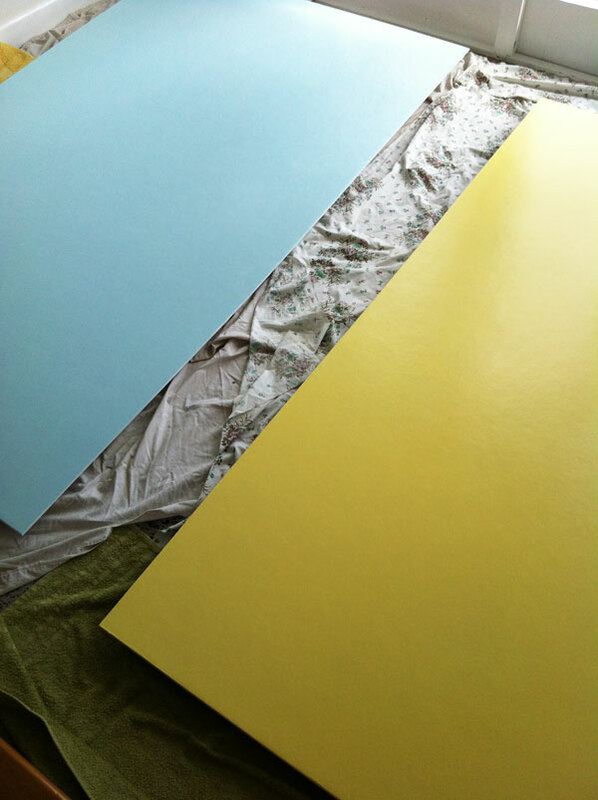 I’ve had a trio of colours in mind right from the beginning (see the inspiration picture here) and even photoshopped them up here, but when it came to the nitty gritty of choosing the actual paint colours, I freaked! There were numerous trips to Bunnings and the Resene Colour Shop and I collected a small hoard of samples, in the hope that one or two swatches would say “hey it’s me! pick me!”. Nope. All silent, even when I taped a few of them up onto the frame they didn’t squeal. But a few days of mulling it over and I finally picked the least saturated of my selections, knowing that on a sunny day the brighter colours would just be ouchie on the eyes. 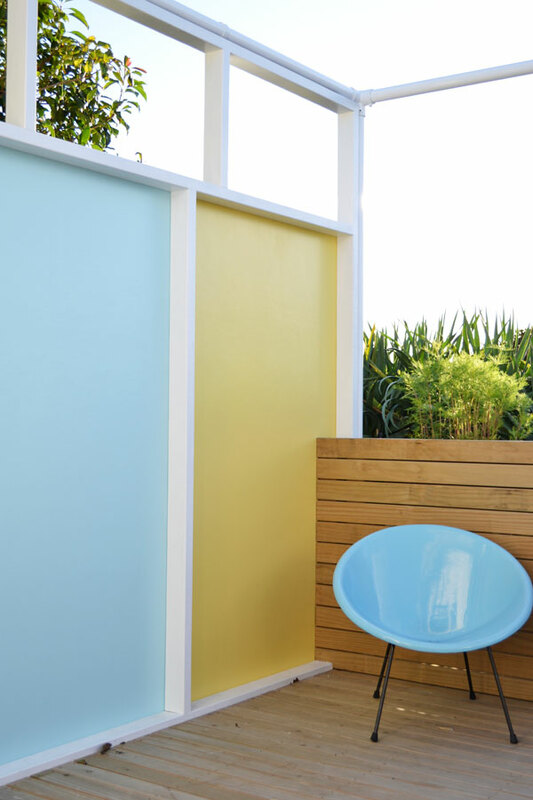 Plus the pastel tones are more true to mid century styling. 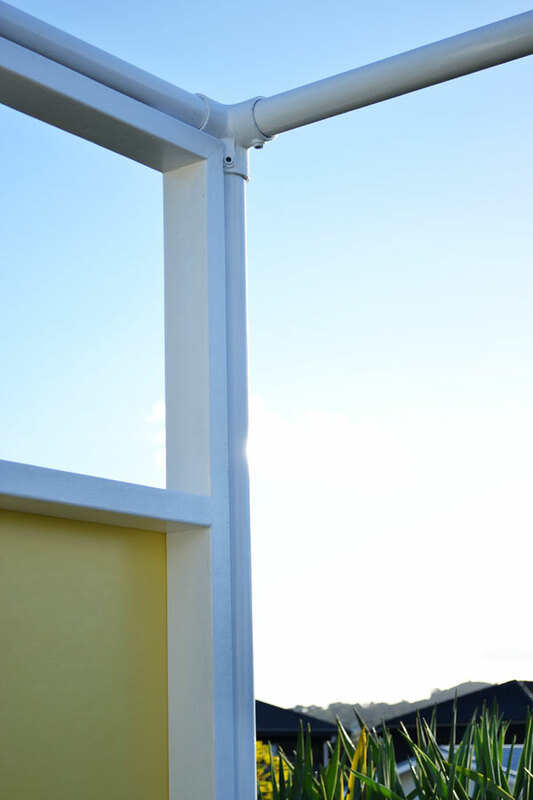 We also picked for the strongest of the colour trio to fill the smaller panel on the left. And I did what I don’t normally do and grabbed some test pots of my chosen colours. Wiser and wiser! 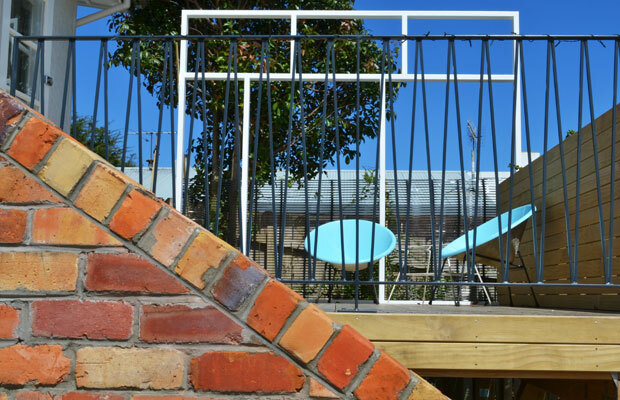 And the lesson is learnt, because with some bigger samples painted up (you can spot them a few images down, halfway through the pergola building process) I changed my mind on the blue. But these screen panels weren’t all I had to paint. 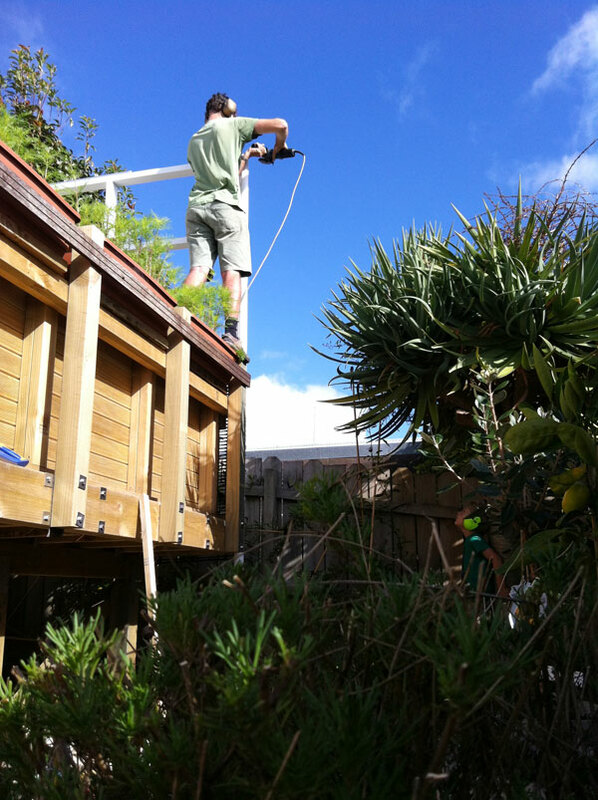 The pergola posts and fittings took me days of endless painting and a few mishaps along the way. It was definitely not my favourite painting project. 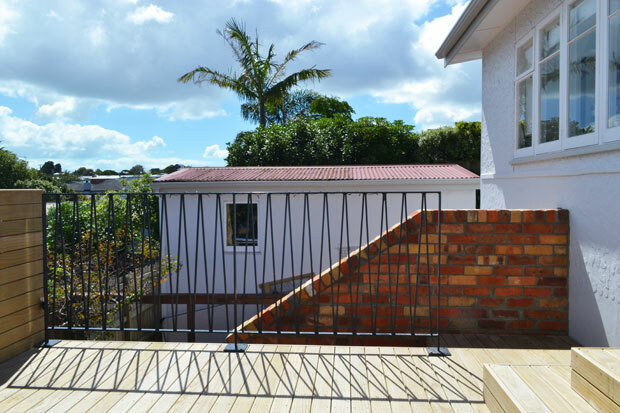 Before we go any further, let me just explain how we came to use steel pipe for our pergola… We knew we wanted something that would span the length and width of our deck without needing posts or bracing all over the place. We also wanted something solid and definitely there, but not chunky, so that ruled out timber (which would have needed to be on the chunky side to hold itself up) and left steel. 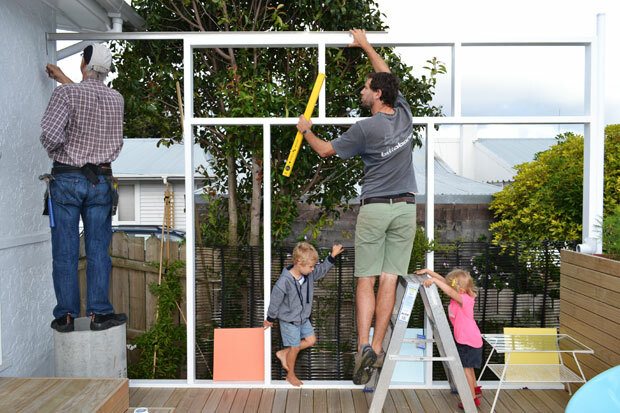 I had pinned a bunch of images of awesome outdoor spaces that used I-beam steel as a pergola frame and so we designed up a frame and worked out how it could all fit together… then got a little concerned at the cost and logistics of having to construct it onsite. It would have been super heavy and needed welding in position. A little too much to ask of a humble husband and wife DIY team. 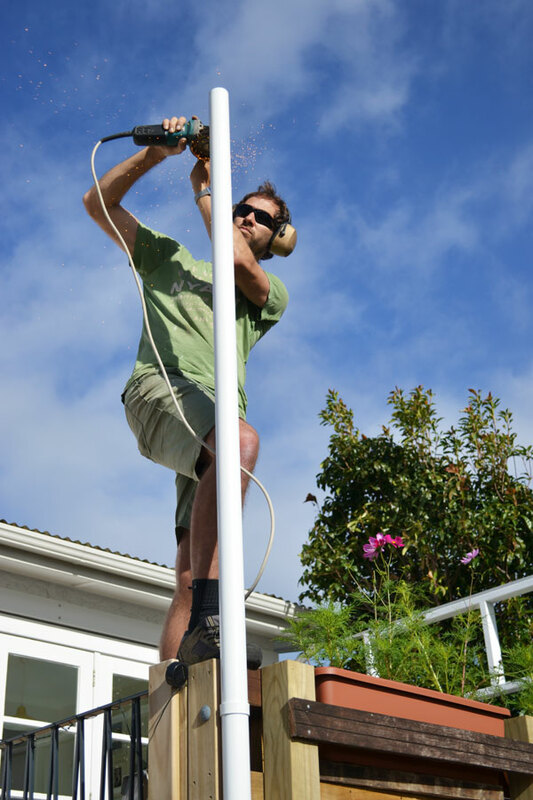 There was no way I could single-handedly (the other one would have been feeding kids) hold up a 4 metre I-beam while Andre perched on top of a ladder with the welder. 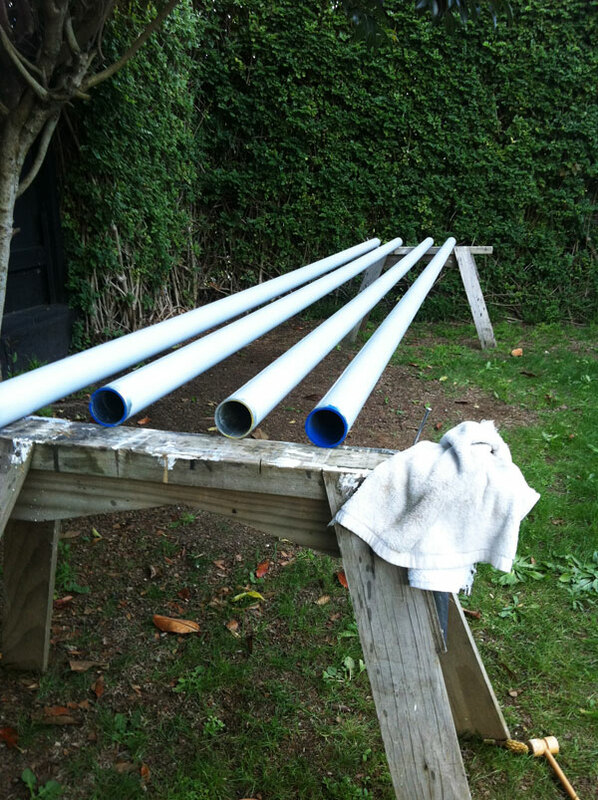 So Andre came up with Plan B: steel pipe and fittings. 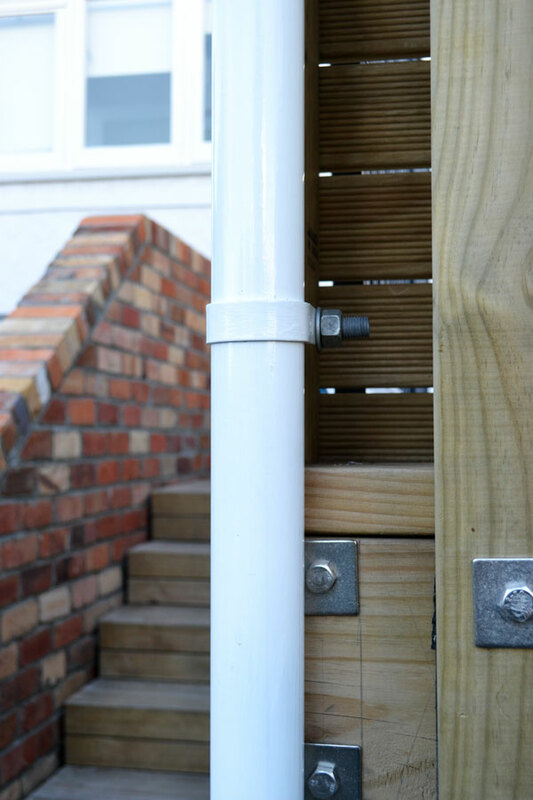 With a 60mm diameter being the largest standard tube size I was worried the whole construction would look too flimsy alongside our bold privacy screen and solid brick wall. But a little scrap pipe visualising along with Andre’s winning smile, and the knowledge we didn’t have any other choice (without spending way too much) convinced me to just go for it. So, with that the pipe was ordered and the painting started with a primer made for galvanised metal (I had to hunt this water based Steelite one down) and then topcoats of gloss white (tinted to Painters white for way better coverage). Next time we do something with steel I’m going with spray paint and probably will start with an etch primer or something like that. 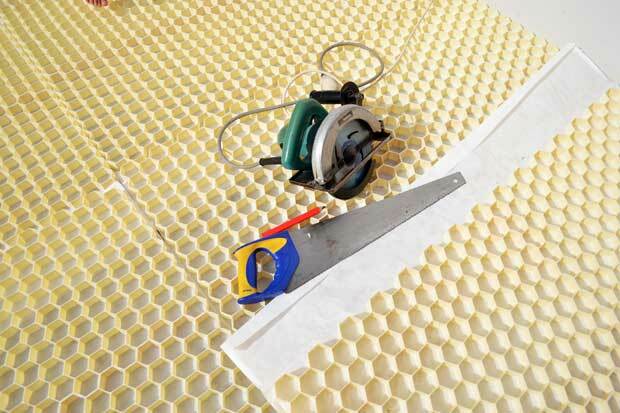 More expensive, but so much easier and a guaranteed better result. We had to do up to 4 top coats to get these pipes and fittings looking good. Te-di-ous. And yes they got rained on and a couple of times as I rolled the pipes to paint them they fell off the saw horses into the dirt. Aaahhh but it’s over now. The posts are all up! 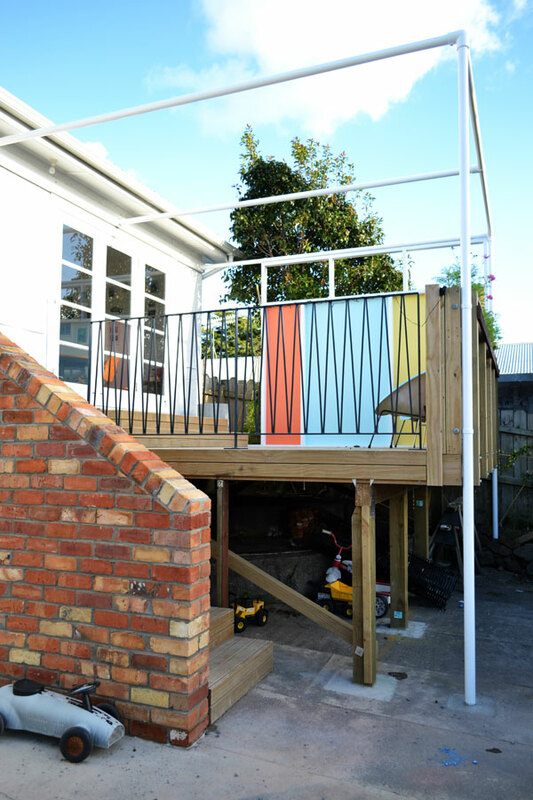 With a last minute dash to Bunnings for a final piece of timber before Easter weekend (and a closed up shop on Good Friday) we were good to go with the rest of the pergola. Or so we thought… unfortunately “we” picked up a piece only treated for indoor use, and we definitely needed something outdoor treated. Oops. 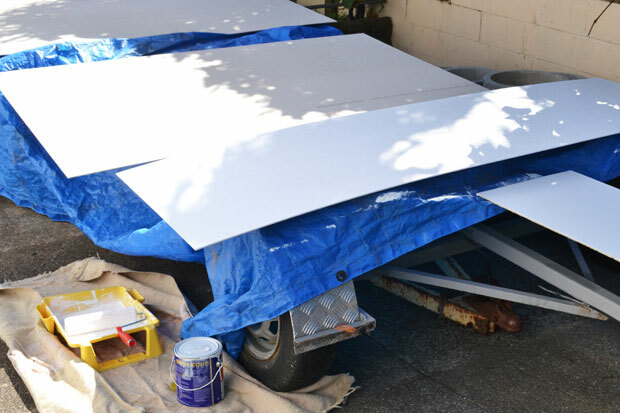 That left us with just a bunch more painting to do on that first precious day of the long weekend, and you already know how that went. 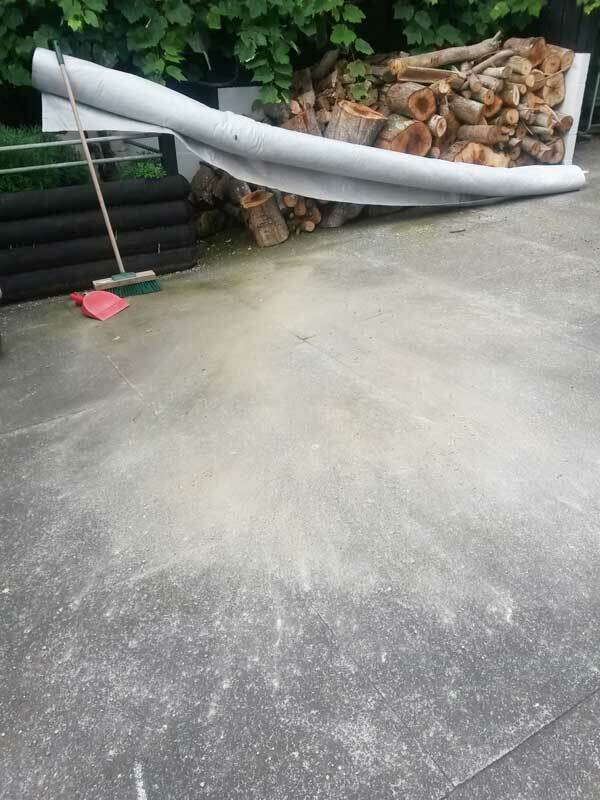 On day two Bunnings was open and the right piece of timber purchased so construction could get back underway. Oh but I forget… it needed painting. And the panels for the screen did too. That sorted the afternoon of day two. And of course it rained again. 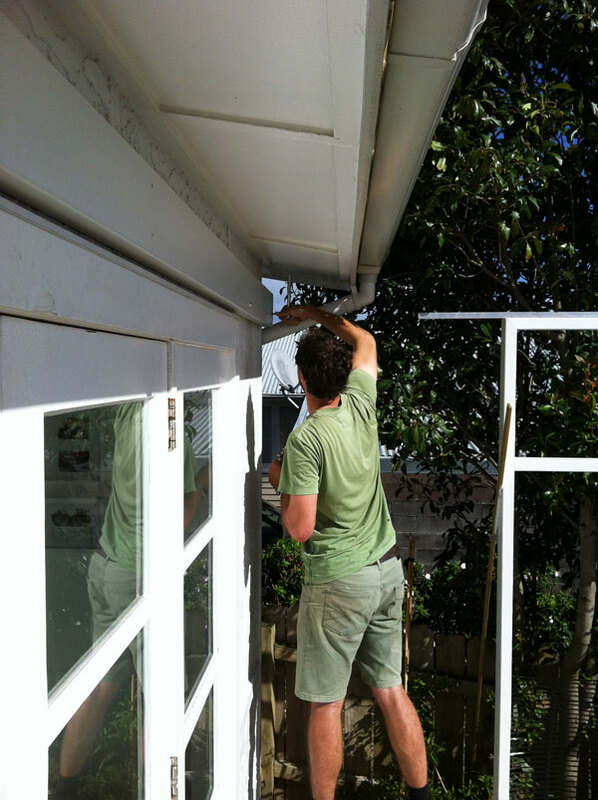 Which brings us then to our third and last day of DIY’ing it on Easter weekend and finally getting this pergola up. 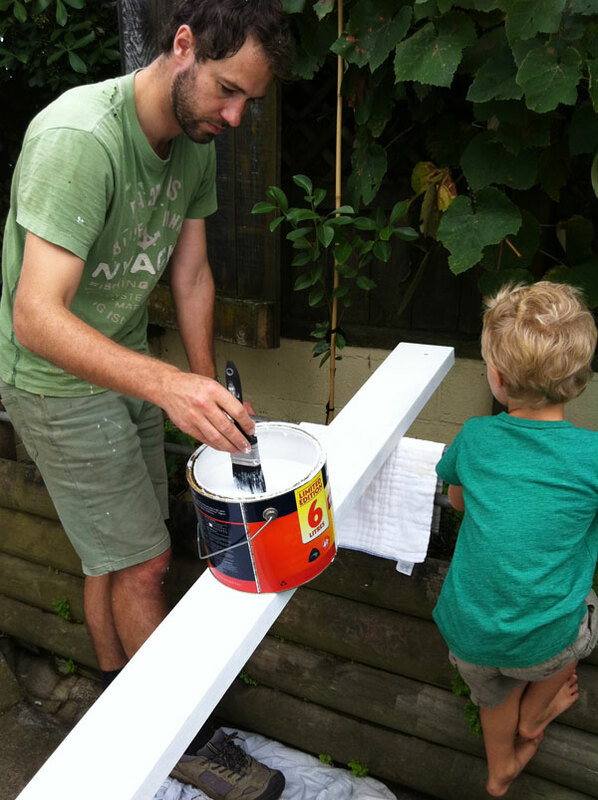 By this time I wasn’t trusting the weather one dot so we rearranged the house to paint the panels inside. Take that rain. 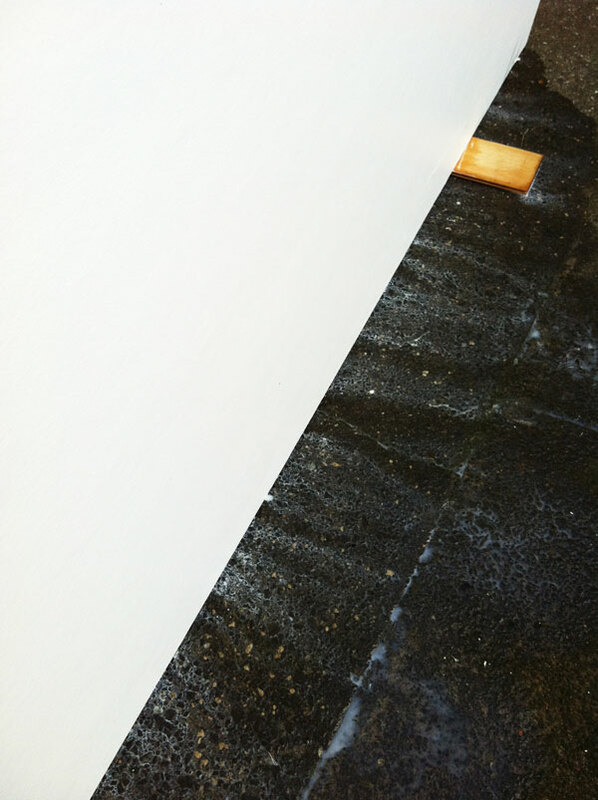 Somewhere in the midst of the late afternoon the last coat on these panels was deemed dry and we hung them. That was a happy moment I tell ya. 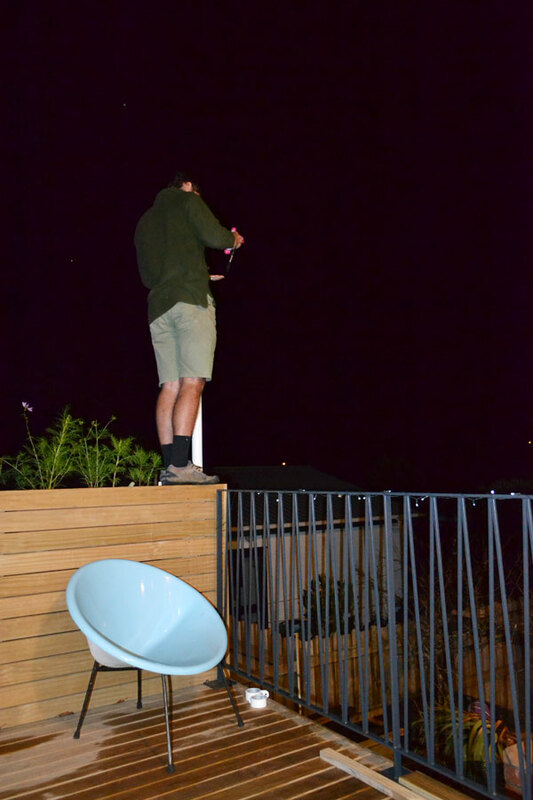 There was dancing on the deck! 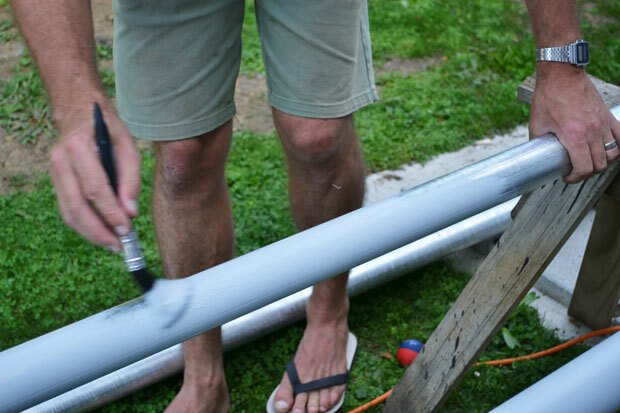 But no photos because I had my hands full of these heavy Durasheets while Andre nailed them into the screen frame. Determined to finish by the end of the weekend, we were back out on the deck after an Easter Monday dinner of fish and chips. It wasn’t until the next day that I even really looked at it! At first I worried that the centre pipe in the “roof” was one pipe too many, but I think it’s just taking some getting used to. Anyway, we have plans for it, involving some shade for next summer so it’s staying put for now, and is an easy task to take it down if we change our minds. 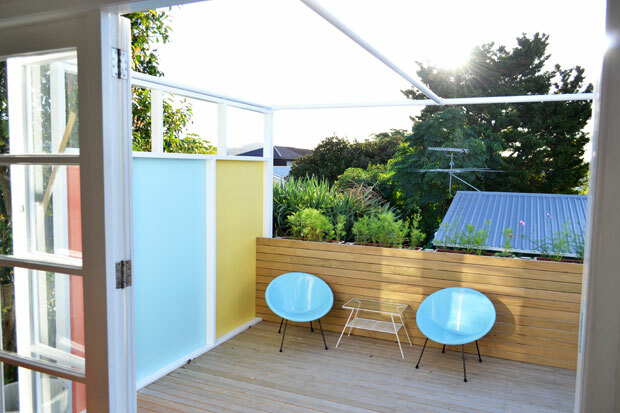 So here’s where we’re at with our mid century flavoured deck and backyard space! 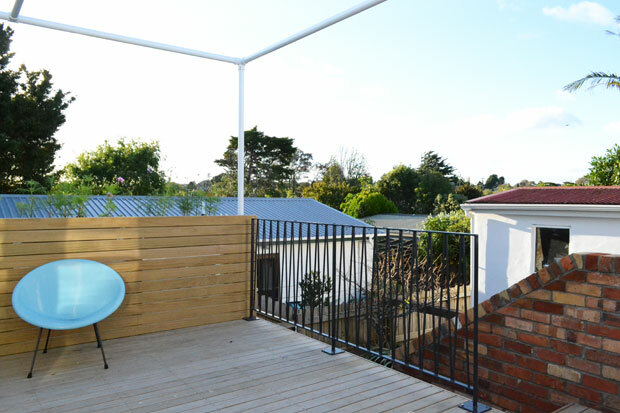 I am delighted with how it makes this outdoor space an extension of our living area, and even Andre no longer scoffs when I use the term “outdoor room”. He gets it! It just feels good out there on that deck! 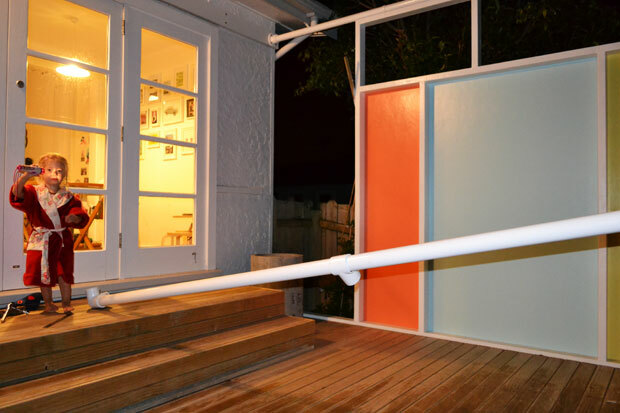 Much like when we built the front fence, the addition of the screen along the side, and the pergola frame makes this space feel like it now belongs to us. It’s cosy. 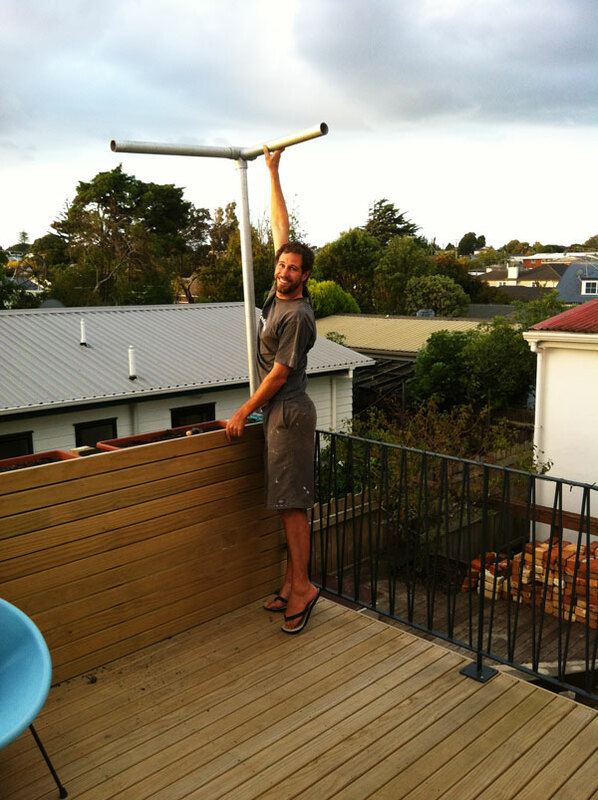 We don’t have to share our deck dancing moments with the neighbours! 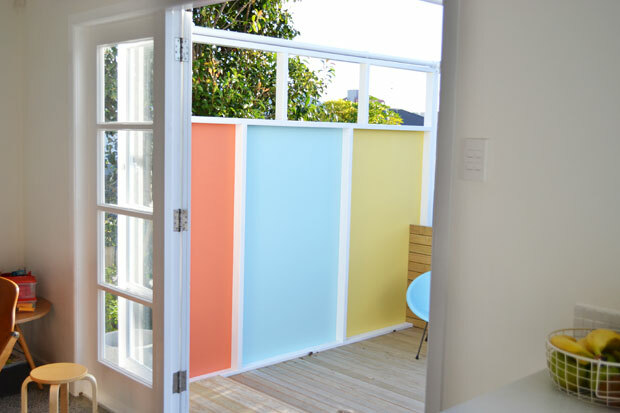 The colours for the privacy screen are, from left: Dulux Te Awamutu, British Paints Water Watch and Dulux Cape Kidnappers. Love them! There is just a smidgeon more building to do out here before we’re calling it quits on exterior work for the winter. 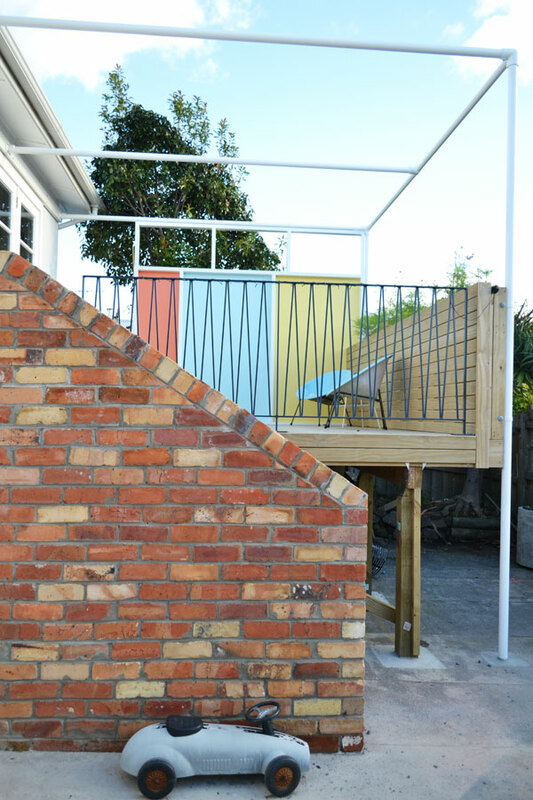 The outside of the planter box on the deck needs it’s decking timber skin (same as the front side) and we’ll do something similar (but more narrower/trellis-looking) to cover in the underside of the deck by the stairs. So of course I’ll be back with that as it happens. But for now, my deck is calling me to enjoy the last of the sun with a bite to eat. It’s well past afternoon tea time according to hungry kids and yes, this post has taken me ALL afternoon! 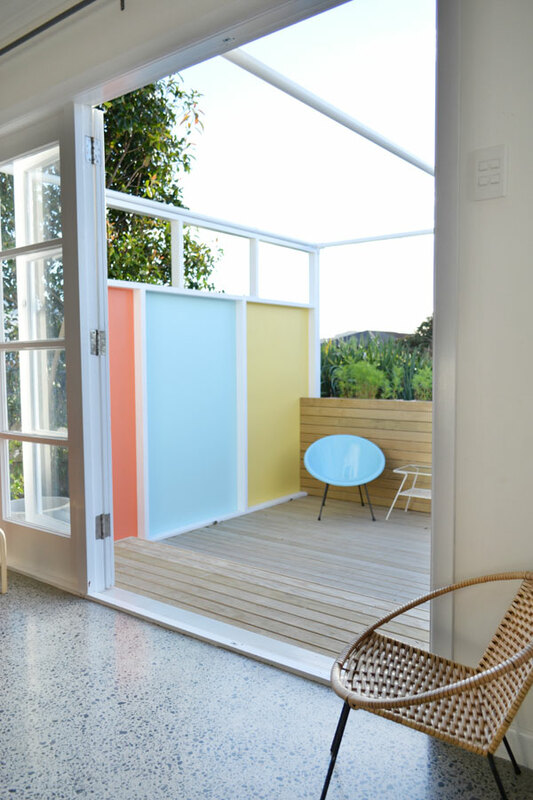 This entry was posted in Garage & Outdoors, Our Renovation and tagged backyard, brick wall, concrete planters, deck, diy, duck egg blue blog, fence, Mid Century, midcentury, outdoors, pergola, privacy screen, renovation, stairs on April 29, 2014 by Jolene. 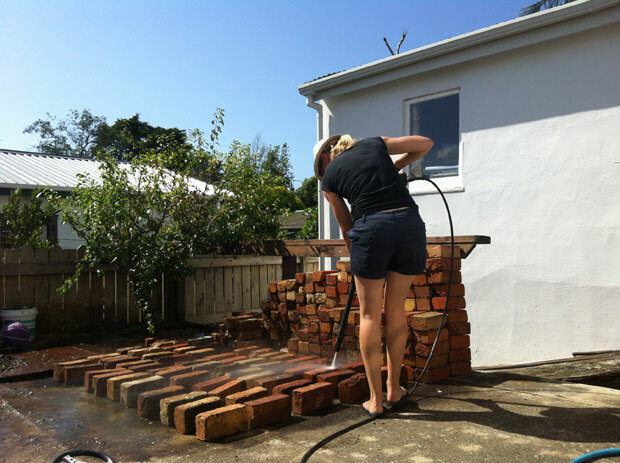 A few days ago I showed you our brick wall out the back, but I wanted to also share the process, in case you’re considering something similar. Because it was a little more of a process than we thought it would be, even though this was a rare project we decided to bring in a pro for. 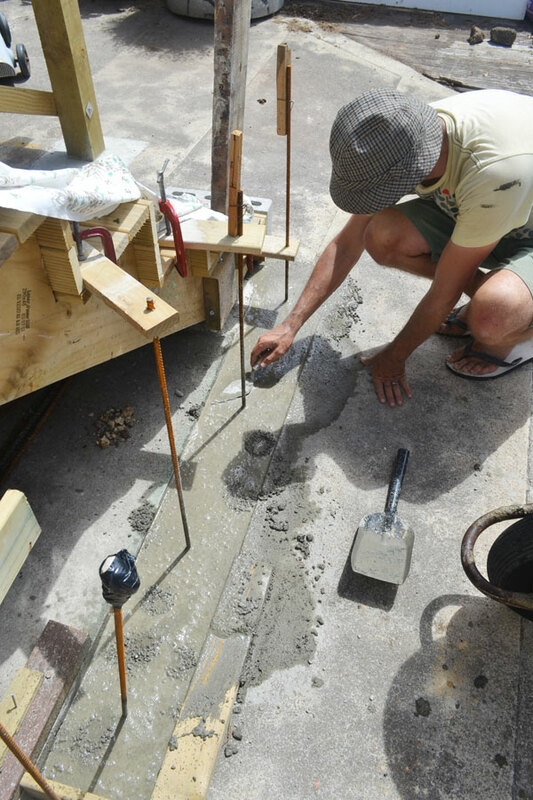 Starting months ago, while the deck was under construction, Andre cut and removed the concrete where the wall would stand. A whole lot of drilling out the rock followed a while later, before it was ready to get a solid footing in place. 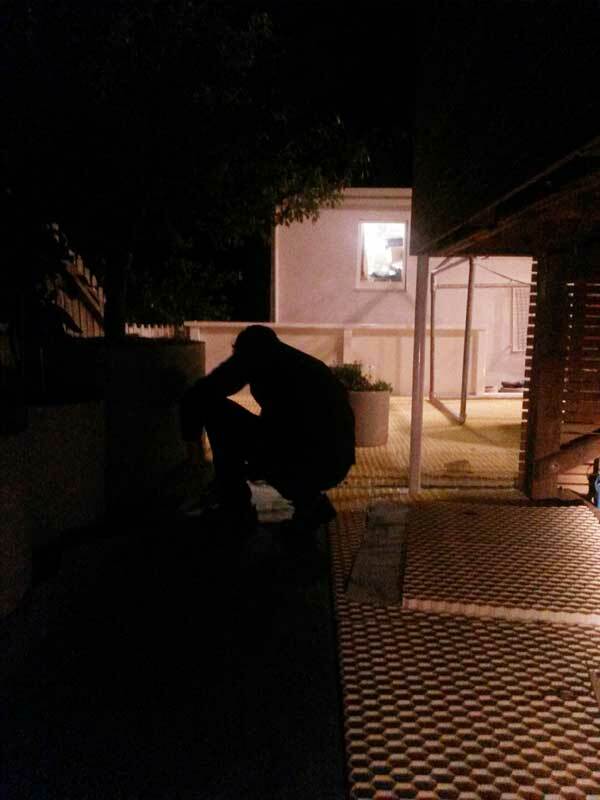 In the meantime, I’d posted the job on Builderscrack, but it appeared there were no willing bricklayers out there. I followed up with a few calls to local bricklayers but noone was interested in a one off, small job like this. 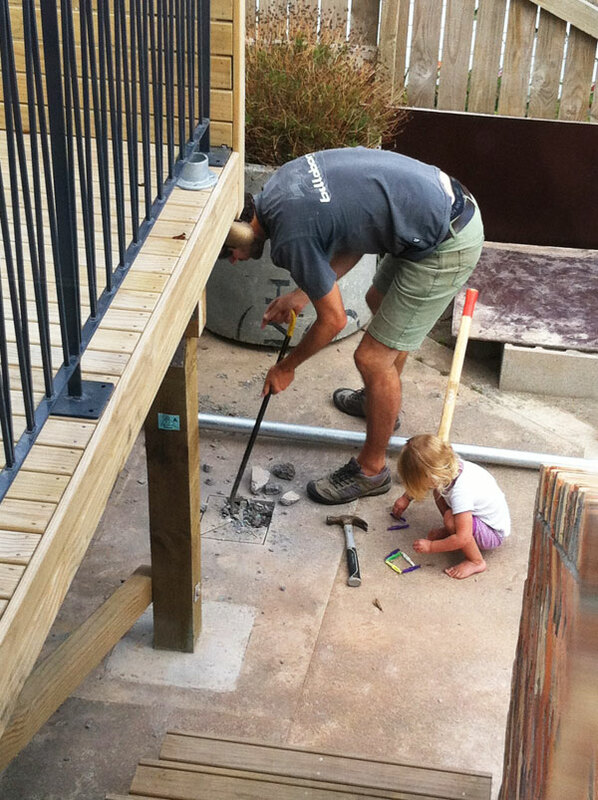 So… we resigned ourselves to doing it the DIY way and finally finishing it somewhere in the next decade! Our attention then was on sourcing some bricks. 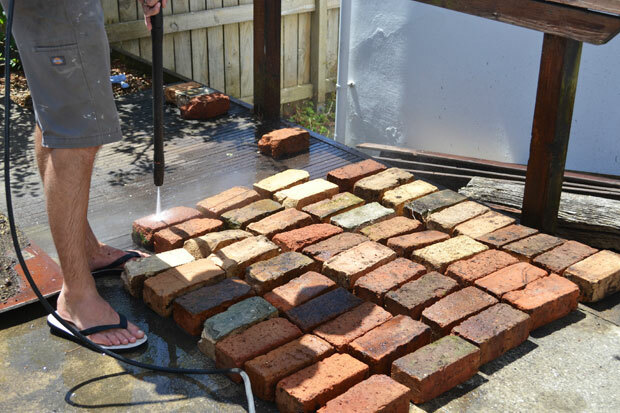 It took a loooong search on Trade Me, but we finally snapped up one lot of 400 bricks. Loading them up, with the help of the sellers, was the easy bit! Unloading them, we realised we were going to need to clean them. They’d been inlaid into the ground as a patio. So thankfully, they’d previously been mostly chipped of their mortar, but a good waterblasting was needed to clear them of dirt and moss. Hours later, we were still going. 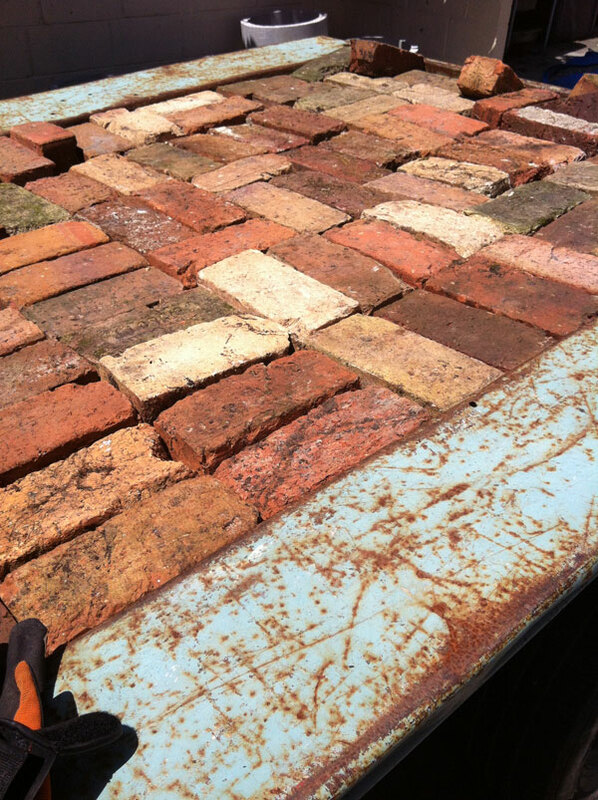 6 sides of 400 bricks is a lot of laying them out, turning them, cleaning them, turning them, cleaning them…. and stacking. Over and over! On the same day we picked up the bricks we got a recommendation from friends who’d just had a guy lay some blocks for their own outdoor space. 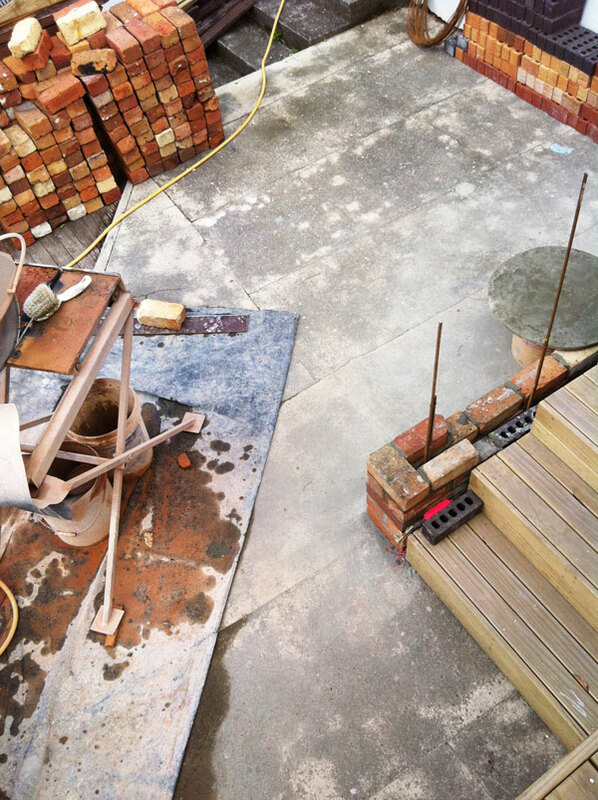 With that came a whole lot of luck in the name of Bob the bricklayer! Semi-retired, he likes the small jobs, and is happy to fit them around his family and other job requirements. With an appointment made for him to come and take a look, we stacked up a couple of options to confirm what we liked best. As we assumed a one and a half width layout was far too chunky. 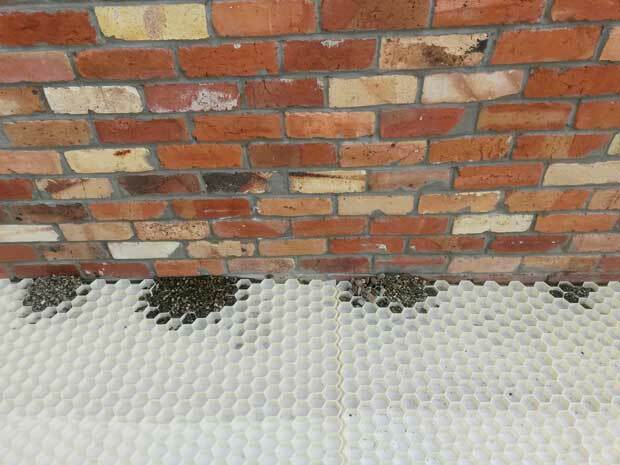 But this single brick width didn’t give us much room for reinforcing and concrete in the middle. 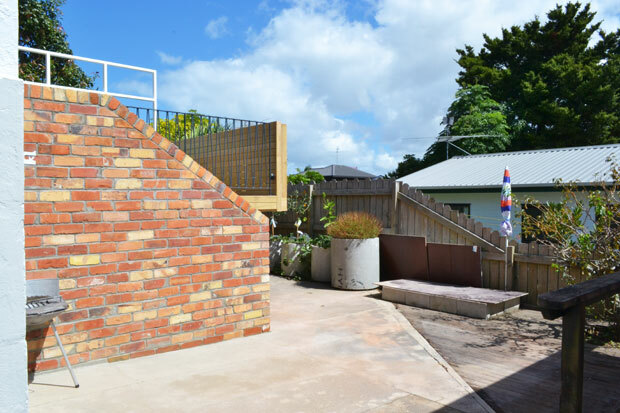 The advantages of hiring a professional were evident right from this point because Bob suggested we use a narrower (modern) brick on the inside of the wall, below the stairs where it wouldn’t be seen, so we could have the look we wanted with the strength we also wanted! It’s a little hard to explain, but you can see a few pictures down how it worked. 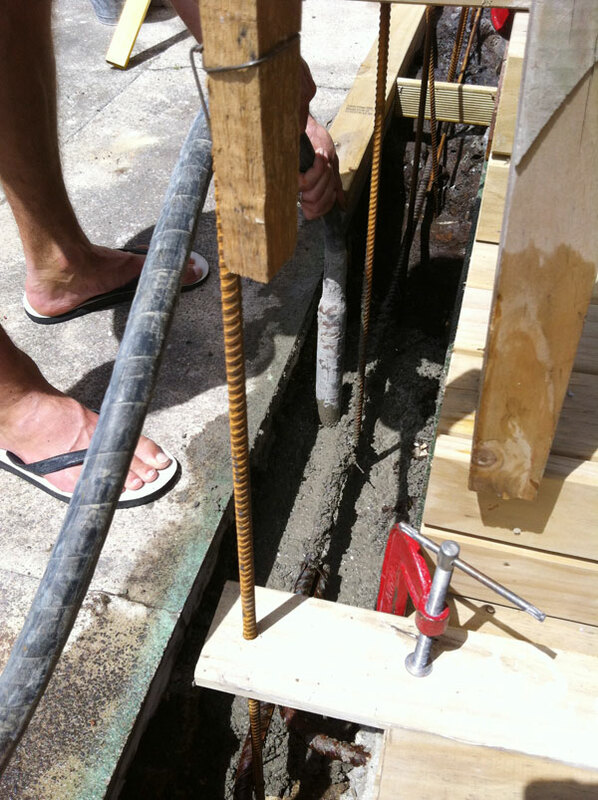 With that confirmed, Andre knew where to put the reinforcing steel and got to completing the footing a few weekends ago. 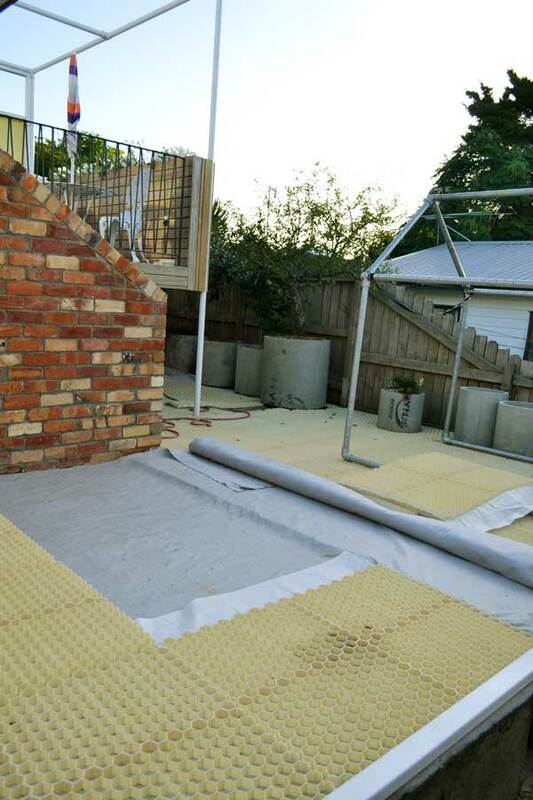 Starting with some steel epoxied in, then some boxing, and finally the concrete. Bob set up shop in our backyard for what he assumed to be 3 or 4 days. 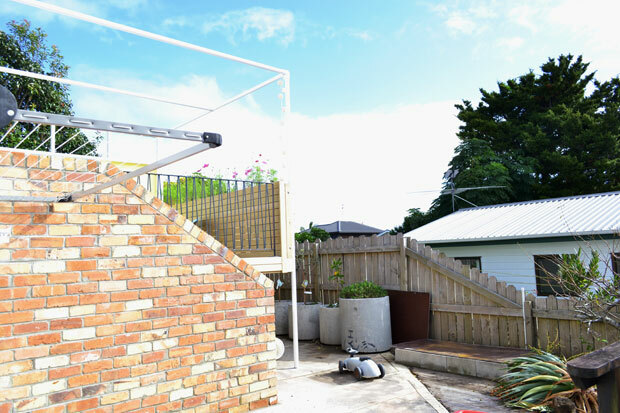 I was very impressed at how organised he seemed to be with his set up, and despite having no backyard (or clothesline) for the duration it wasn’t at all tedious. He even swept up after each days work! Day one got us to just a few small “courses” up. Below you can see how Bob used the narrower bricks (stacked at top right) on the inside of the wall below the stair level. 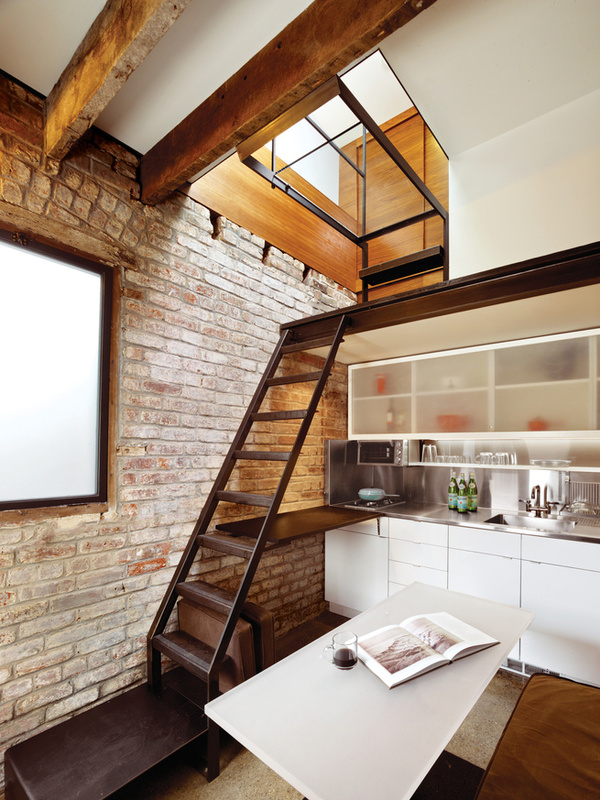 And above the stair level he cut each old brick to the narrower width to match. 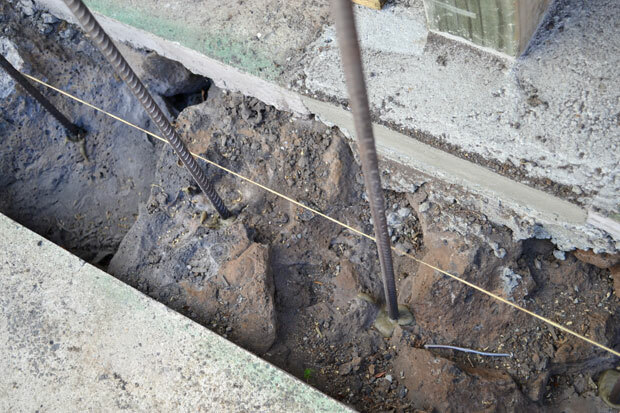 You can also see how he tied additional lengths of reinforcing steel in as he built the wall up, and filled it with concrete too of course. In addition, he drilled into the block base of the house and set some steel into there too, so this is one super solid brick wall! 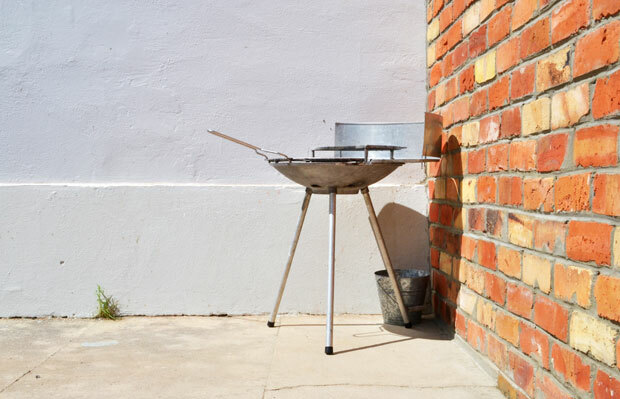 Unfortunately for Bob, he picked some of our hottest days of the summer to work out here in this sweltering backyard with no shade and no breeze. Combining that with the amount of cutting he had to do to ensure all those old and mismatched bricks would fit into the wall, I’m thinking it wasn’t his favourite job to date! 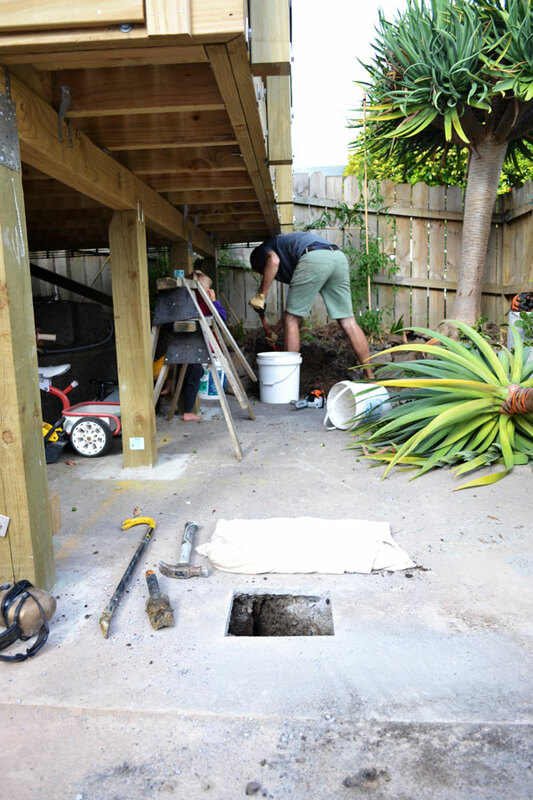 It also took a lot more time than he estimated so it wasn’t until two weeks later (with a couple of days off in that time) that he packed up his brick saw and took our money! 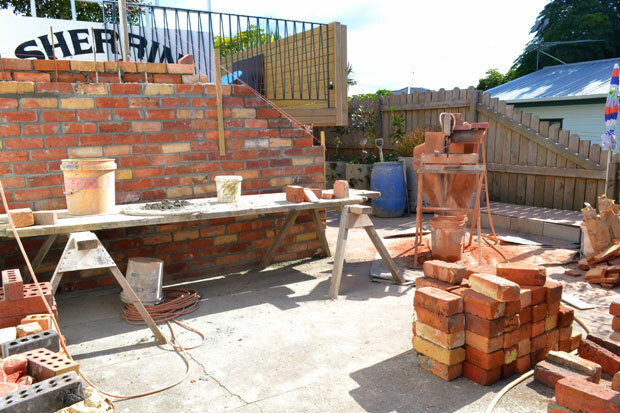 Incidentally, our estimate of 400 bricks wasn’t nearly enough (due to quite a few of them being too beaten up for Bob’s liking), and Andre spent a few more hours hunting out another 100 or so from every demolition shop around Auckland. And Mum and Dad saved the day with the last 10 bricks we needed, which they’d just found around the back of their shed during a massive tidy up before they move house! I’m very thankful that we did hand this job over to someone who knew what they were doing, not only because it happened much faster than we could ever have done it (even though it took twice as long as estimated!) but also for the peace of mind that it’s done right. 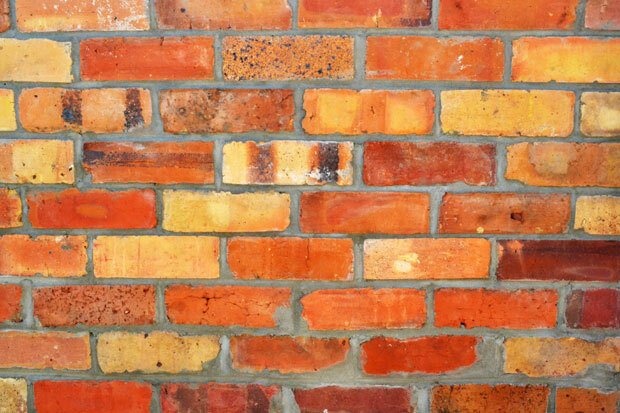 To be honest, we wouldn’t have been nearly as fussy with the bricks as Bob was, so we might have saved a bit of money doing it ourselves, but the finished product would have been a little dodgy! 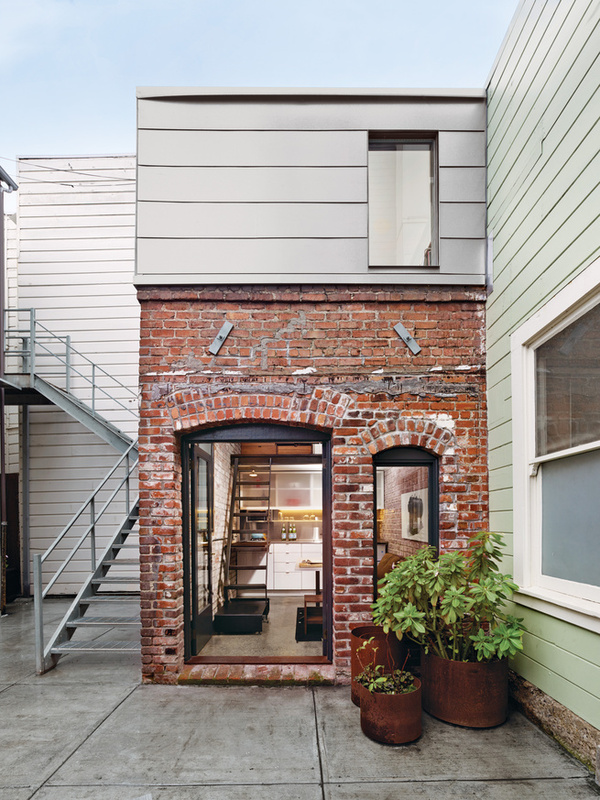 And that’s really not how you want a brick wall in your backyard to be! 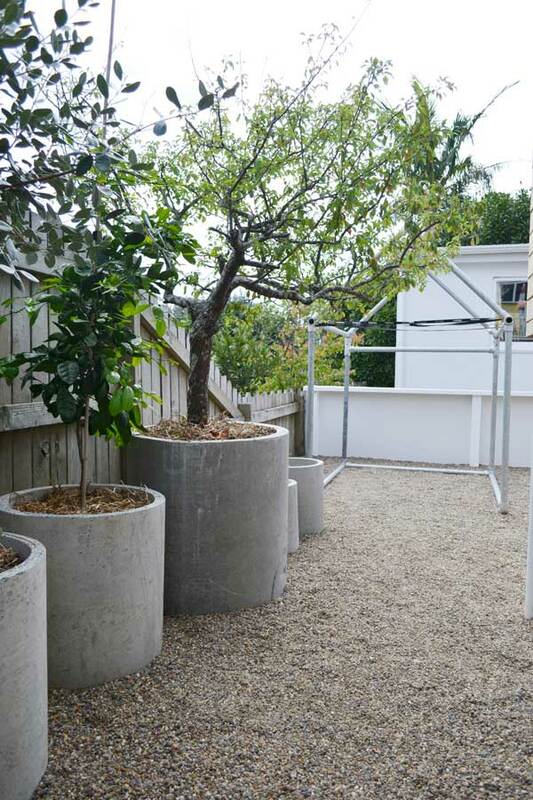 All up, this one cost us around $1600 – ouch! But the pain was very short term and all over once the cash changed hands and I turned around to take another look at the wall! 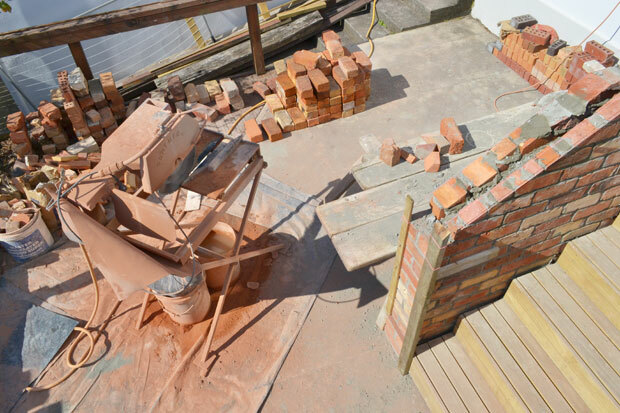 The old bricks we bought ourselves came to $364, reinforcing steel a mere $52 and the labour, mortar, builders mix and handful of narrower bricks Bob supplied was $1192. 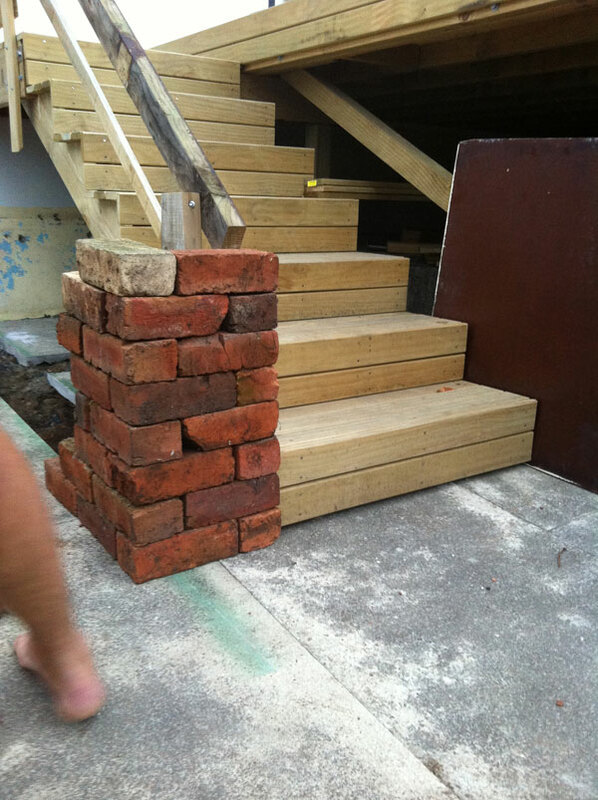 So to DIY this would have cost us around $800 in materials anyway. Which means for only $800 we got the job done within two weeks. Definitely worth it! 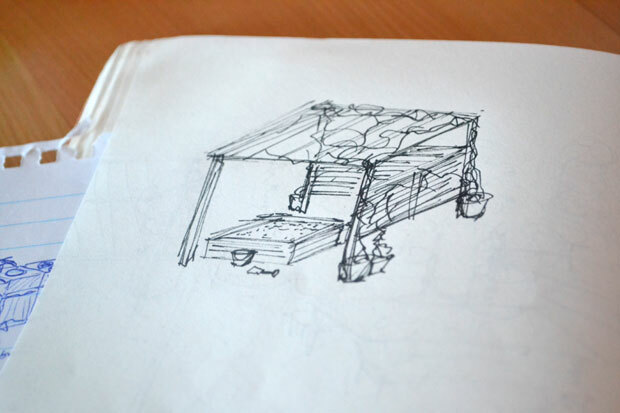 I’m just hoping this amazing autumn-but-more-like-summer weather will hold so we can get the pergola done soon. 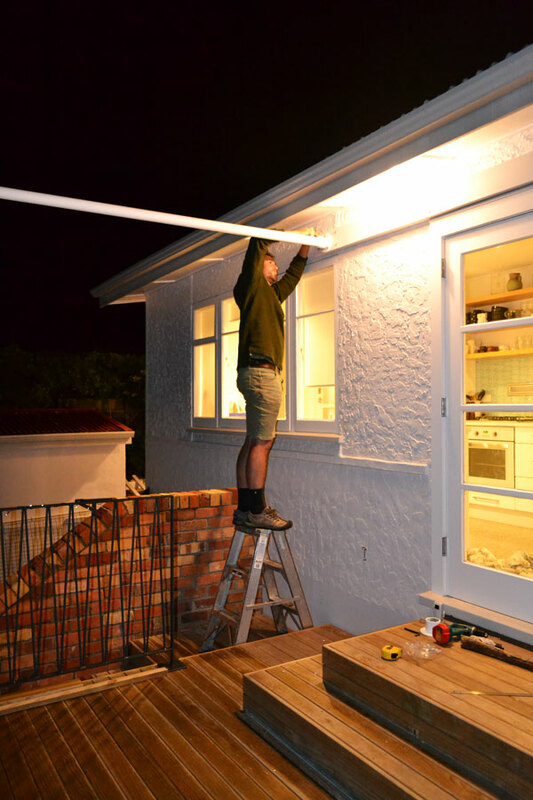 Because we’re definitely DIY’ing that one! 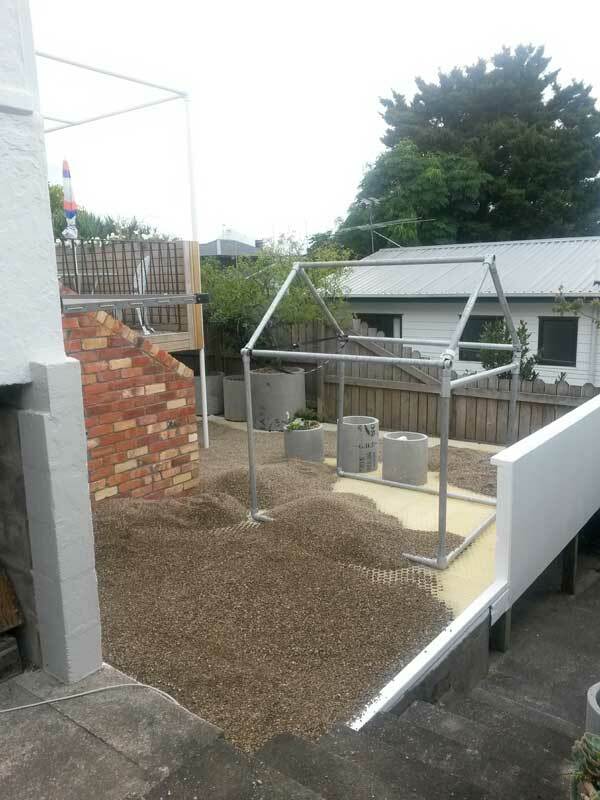 This entry was posted in Garage & Outdoors, Our Renovation and tagged auckland, backyard, brick wall, bricklayer, construction, deck, demo bricks, diy, duck egg blue, footing, old bricks, recycled bricks, renovation, stairs on March 22, 2014 by Jolene. …It is looking mighty fine! 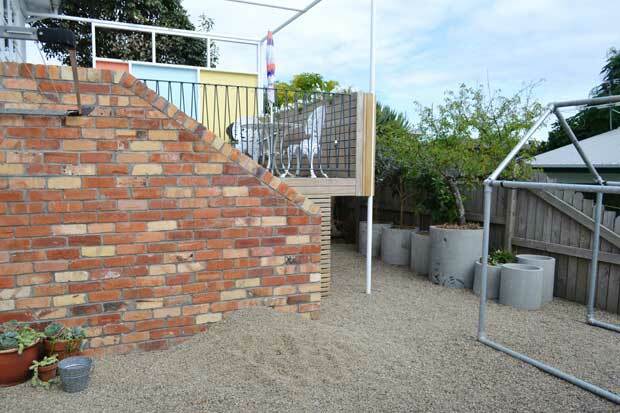 After two long weeks I can finally share our finished brick stair wall. I even managed to wait patiently for the rain that was promised over the weekend, to wash all the orange dust away so I could show it to you at its best. It was hard… but worth the wait! I love it! Really, really love it! As it started to go up I thought “shivers, that’s really cutting our backyard in half!” But it’s perfect. 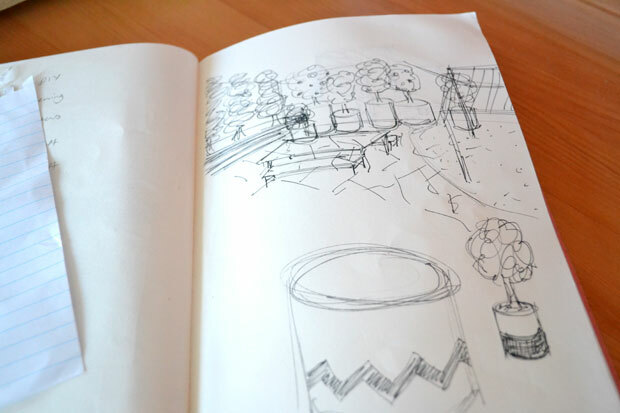 It’s a big step in creating the outdoor spaces that we originally planned. Space for relaxing, space for playing, and space for storage and services. There is still a fair bit to do to make these spaces more defined but this brick wall feels like the biggest step of all. 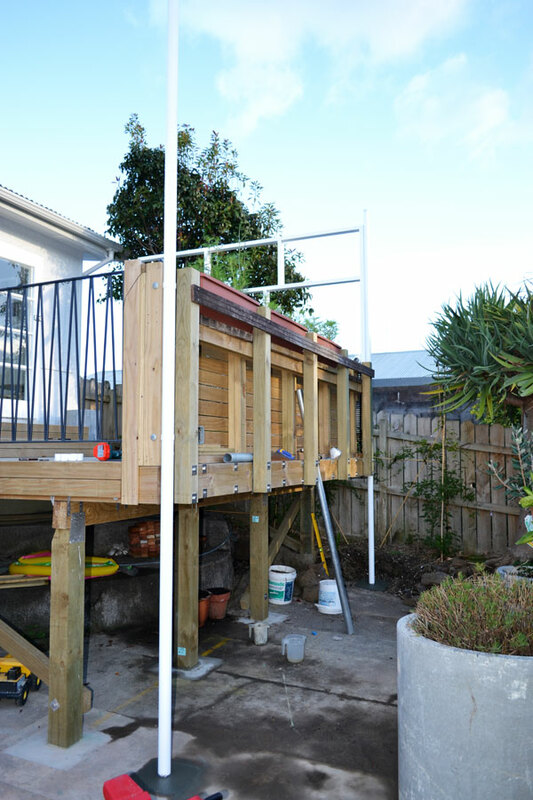 Next up we’ll be working on a steel framed pergola over the deck (which reminds me… I need to pick up the fittings for that today!) and closing in the gap under the deck. There’s so much useful storage under there so we’ll possibly not close it in entirely, or we’ll put an opening section in so the kids can easily get their toys in and out. Or at least out. It seems to be my job to tidy things away still, but I’m working on it! 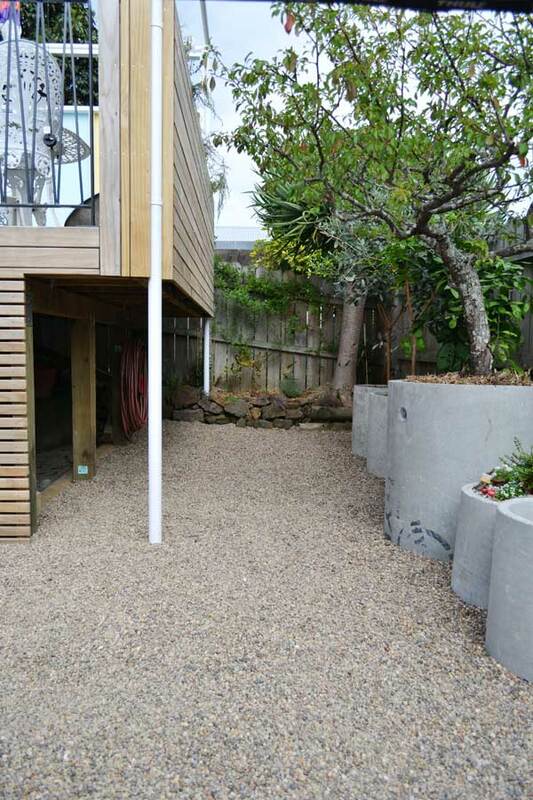 Beyond that we need to decide how to approach the rather boring area where the kids sandpit and the plum tree currently sit. But we’re happy to mull that one over and don’t plan for anything to be happening there until next summer. By the way, we got the door on in our bedroom! The predicted storm was less stormy than rainy, but it still kept us inside and got that done. It’s a small thing, but it’s big too yes?! 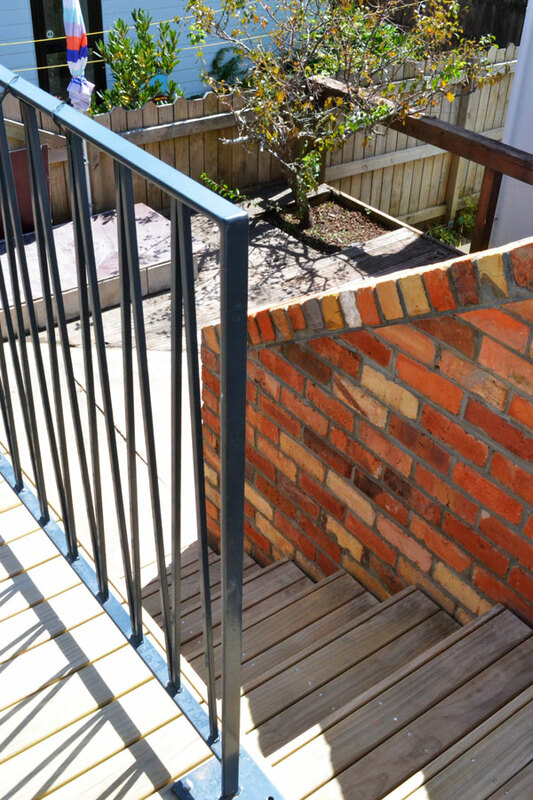 This entry was posted in Garage & Outdoors, Our Renovation and tagged 50s house, backyard, balustrade, brick stairs, brick wall, charcoal barbeque, concrete planters, coolie chairs, deck, duck egg blue, Mid Century, midcentury, old bricks, renovation, sandpit on March 17, 2014 by Jolene. 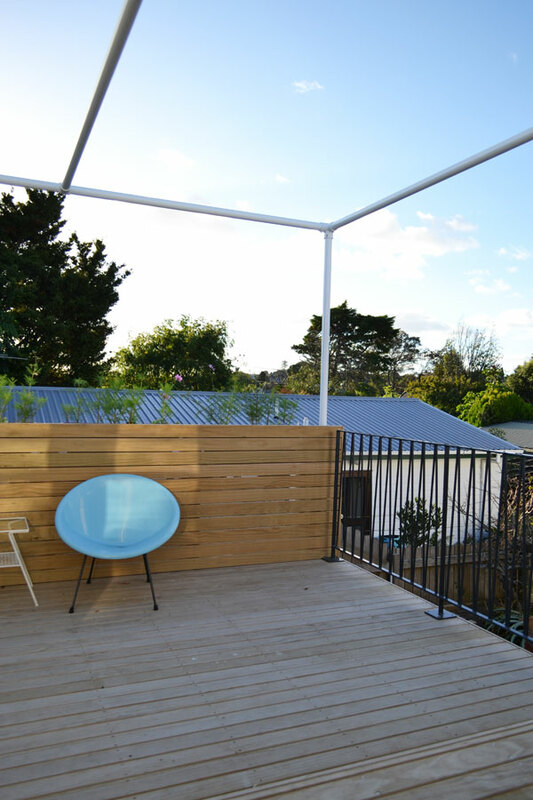 I’ve been making the most of the Auckland winter sunshine and getting outside into our backyard (such as it is) and dreaming of how it will look this time next year. Fingers crossed! 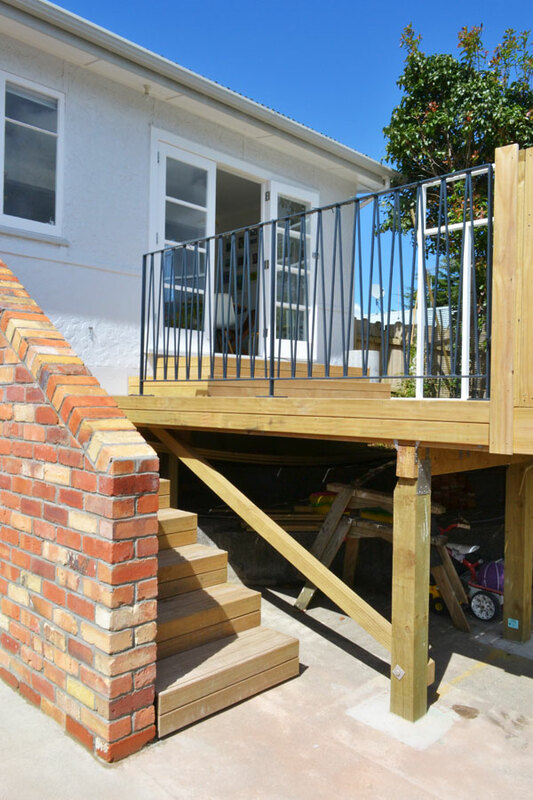 With a builder waiting in the wings we’ve had to make a decision on the deck. 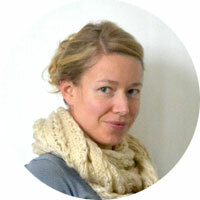 You might remember we started with two quite dissimilar plans? I’ve sort of fallen for one of them. 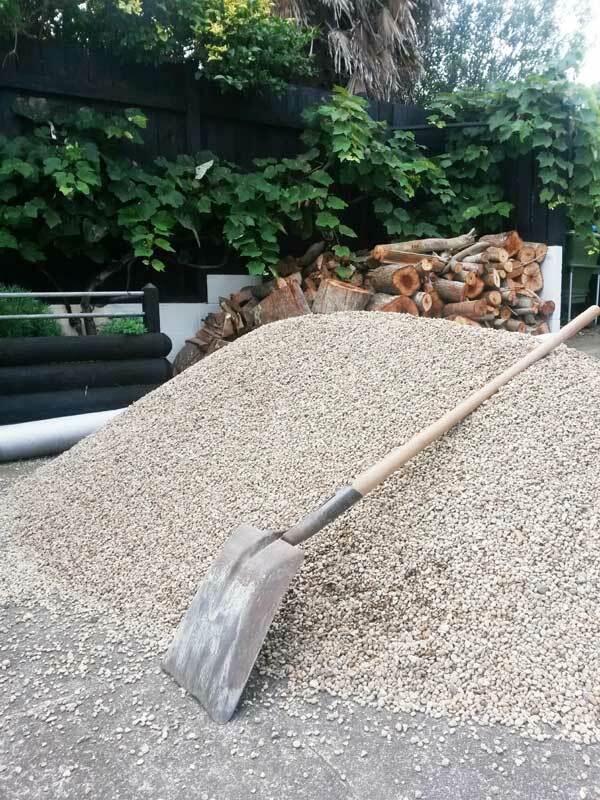 We’re going crazy paving (once I convince Andre we need to break up the concrete!) 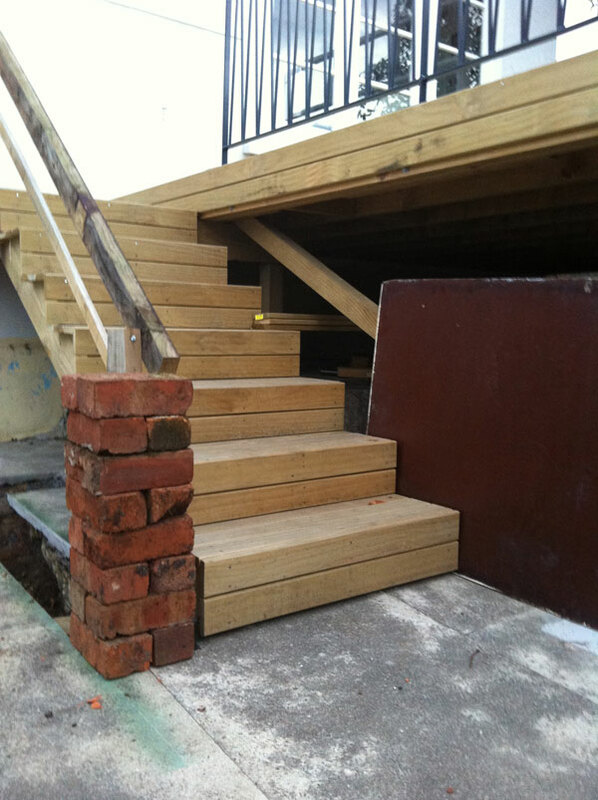 and a small deck. 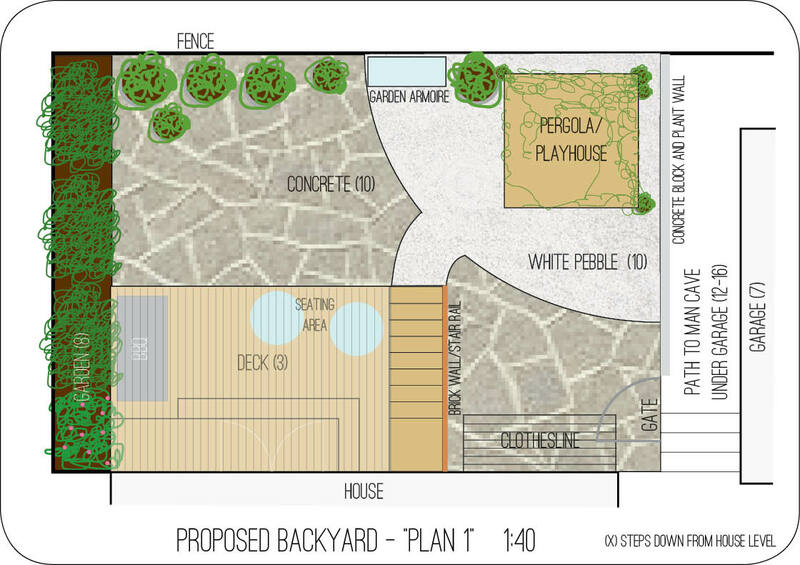 While the multi-level deck would have been fun, and a great play space for the kids, we think this plan suits the house better, allows us to work with what we have (and hopefully save some money) and provide more variation for kids play (and adult zones!). 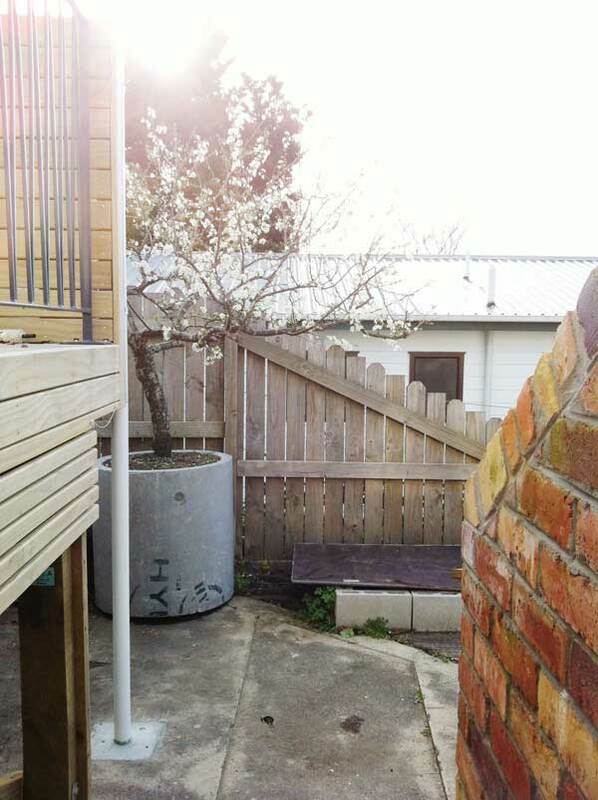 Since the previous version of this plan we’re thinking of keeping the entire existing raised garden bed at the left, and will plant either a screening hedge or potentially make it a vege garden. 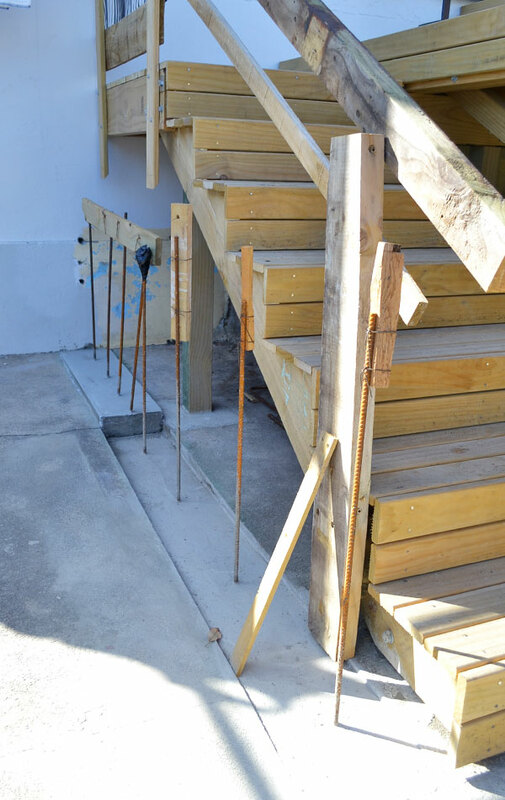 To allow more room for an outdoor dining table on the open concrete space beyond the deck, we’ve also decided to keep the stairs to the right of the deck. 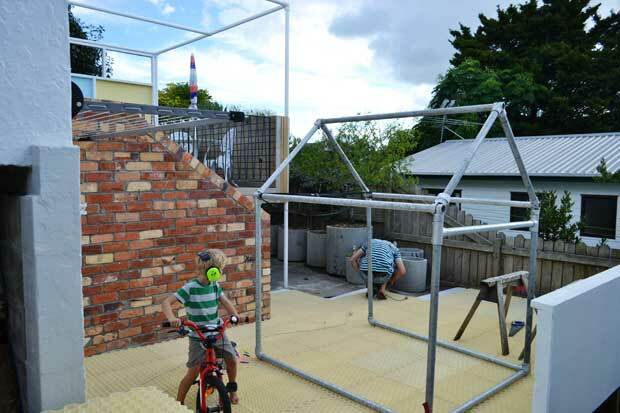 I’m not yet certain of the pergola/playhouse structure but I’m thinking something semi closed in with screens and a climbing vine on two sides and the roof. 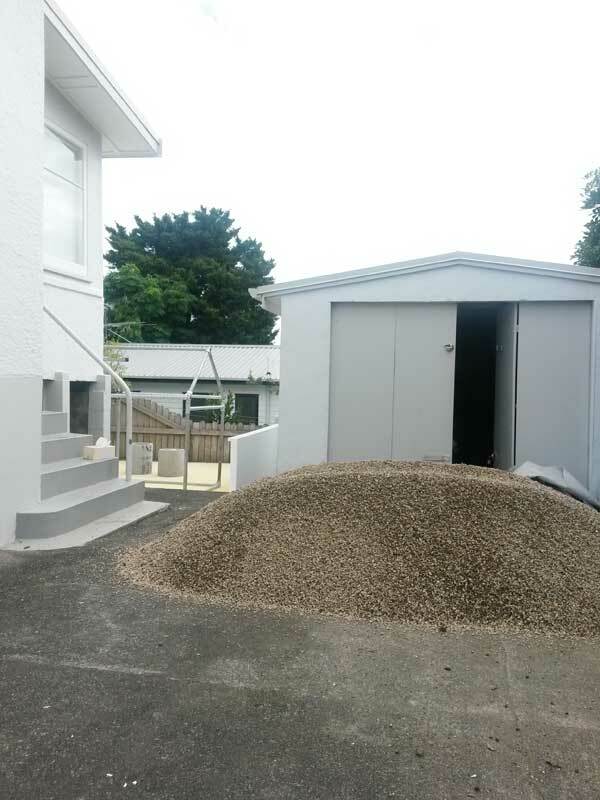 More than likely it’ll house a sandbox and some simple benches. I kind of think it would be fun to create an outdoor play kitchen, but I must remember kids can make that happen with whatever is around all on their own! Let’s not overcomplicate things! 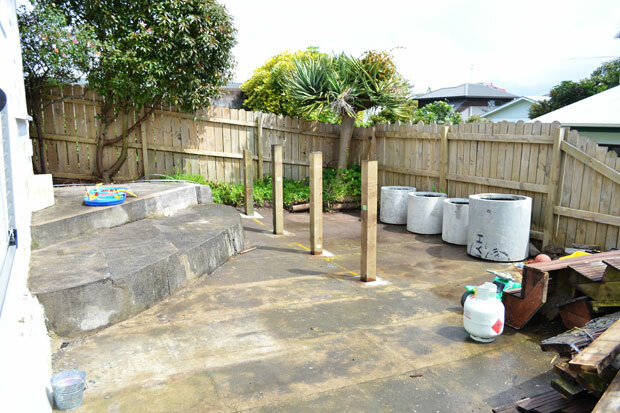 This entry was posted in DIY, Garage & Outdoors, Our Renovation and tagged auckland, backyard, brick wall, building, crazy paving, deck, diy, new zealand, pergola, plans, planters, renovation on July 2, 2013 by Jolene.